This flavorful soup is rich and creamy, and makes a quick and delicious lunch. Riced cauliflower provides and stealthy thickener – low carb and flavorless. Using canned, diced tomatoes makes this recipe especially quick and easy, but feel free to use fresh, ripe tomatoes if you prefer. 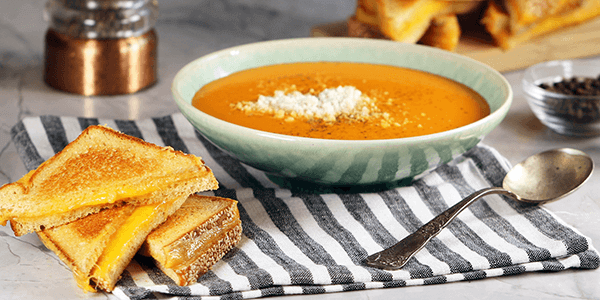 Pair with a grilled cheese sandwich made with Sola Low-Carb Bread and sharp cheddar cheese for the ultimate low-carb lunch. Place a large saucepan over medium-high heat and add the olive oil and butter. Once hot, add the onion and garlic and cook for 5 minutes, stirring constantly. Add the riced cauliflower and continue to cook for a further 2-3 minutes, stirring well. Add the diced tomatoes, cream, chicken stock, Sola sweetener, vinegar, spices, and seasoning, and bring the mixture to a boil. Reduce the heat to a rolling simmer and continue to cook for 20 minutes. Remove the soup from the heat and use an immersion blender or food processor to purée until smooth and creamy. Pour into serving bowls and garnish with freshly ground black pepper and shredded parmesan cheese.